Our latest project utilizes CAD (computer aided design). It is a combination of two of the world's most beautiful cars "morphed" together. 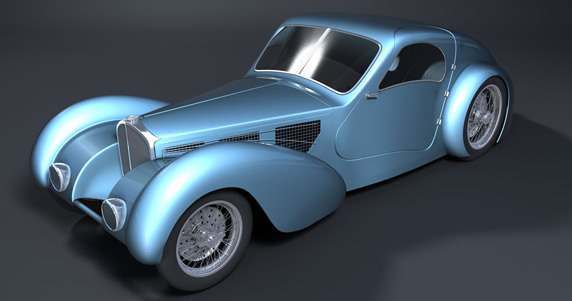 The front 2/3 of the car, from the back of the door forward, emulates one of the rare and famous cars in history, the 1935 Bugatti Type 57SC Atlantic designed by Ettore's son, JEAN Bugatti. 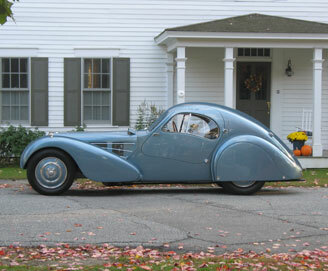 The back third of the car from the rear fender back is a copy of the Marcel Pourtout coachbuilt 1939 Talbot-Lago T150C SS Coupe, designed by dental technician (and part time car designer) Georges PAULINE. Hence the project name "JEAN PAULINE." 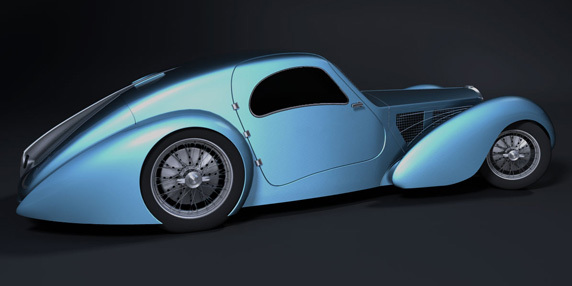 DECO RIDES collaborated on this design with a 19-year-old talent from England, now living in Orlando, FL, Steven Egan. We found him through www.smcars.net. Working with Steven has been an absolute joy and we feel the results speak for themselves. Hopefully this is the first is a series of Terry Cook and Steven Egan projects. Car styling is my absolute passion. Jean Bugatti and Georges Pauline are two of my four favorite designers, with Russian Jacques Saoutchik and Italian Guiseppi Figoni being the other two. Sadly Jean died in an accident test driving a Bugatti and Georges Pauline was executed by the Nazis for being a member of the French underground. Before his death, he designed some of the world's most beautiful automobiles including the Embricos Bentley, the Peugeot Darl’mat and the stunning Delage DS 120. The JEAN PAULINE Teardrop Coupe is our tribute to these two great stylists. The notable differences in our design are that the external body and fender flanges that protrude from the Atlantic have been eliminated. To improve the creature comforts, the passengers' compartment has been lengthened and widened five inches. The wheelbase has been stretched from 117 inch to 122 inches. The roof is the same height as the Atlantic and Talbot-Lago, but the floor has been lowered three inches. The idea of the longer, wider passengers' compartment and lower floor is to provide sufficient room for two 6-foot 6-inch passengers with wide shoulders to fit comfortably inside. For those of you who ask “Why don’t you just make a copy of the Atlantic?" I would never consider doing such a thing as that would be SACRILEGE, particularly if done in fiberglass. For your information, the real Bugatti Atlantics that exist are owned by Ralph Lauren (valued at 30 million US dollars) and the late Dr. Peter Williamson's widow Susan (valued at 30 to 35 million US dollars, soon to be privately sold to a wealthy collector). A third original Atlantic that was involved in a train wreck is being restored. There have been perhaps a half dozen or more alloy bodied Atlantic replicas built in the past 60 years (one of which is owned by Jay Leno), built by coachbuilders such as Crayville in England and Erik Koux in France. One alloy Atlantic replica recently sold for one million Euros (1.5 million $ US). A used car dealer in Belgium named Dedobbeleer also built several in the 50s. An unrestored Porteau Talbot-Lago (one of only four in existence) sold at auction at Pebble Beach in August 2008 for more than four million. It was in original condition, and if it had been fully restored, the value would have been only half as much! I've got skilled, reliable, honest fabricators with reasonable hourly labor rates ready to tackle such a project. So if you're looking for a cheap "kit car" body, you've come to the wrong place. There are trillions of "kit cars" out there on the market for you to pick from. My company builds individual works of rolling art. If you want to see it become reality, contact me at (908) 876-9100 or decorides@aol.com. we wanted you to see it. 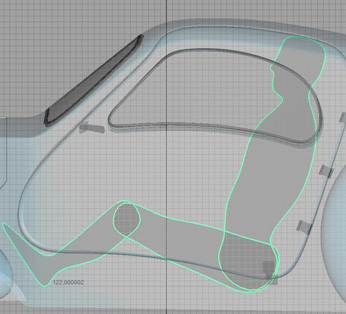 The car will be available with or without rear fender skirts. ATTENTION THIEVES: This design has a patent applied for and anyone copying or reproducing our design will be severely prosecuted by Appleton Productions.